Sometimes, things get a little too spicy in the kitchen. Like, too spicy for even the pepper. Add fat: Things like sour cream or avocado help cut the spice. These two work especially well for chili. I made a Chipotle Black Bean Chili that made you tear up just by smelling it, so I added peanut butter and Mexican Crema. Then I loaded cheese and avocado on top. Then I gained 50 pounds. Add sugar: Sugar can cut through the heat and works well in certain types of cuisine, like Thai. You can make a gastrique with vinegar and sugar and add that to your dish to help balance it out. Carrots are also known to take heat away. Make a carrot puree and add it to your soup or chili and their sweetness will counteract the spiciness. Add contents: You can help dilute the spice by adding more ingredients. Add more protein, beans, rice,vegetables, etc. and say no to more seasoning. And a bonus tip? Try your hardest to slowly add things, like spice. It’s much easier to add than to take away, so season with your spices and taste. If it needs more heat, add it little by little, tasting each time. The same rule goes for when you’re putting your ingredients in to cool it down. But don’t cool your food down too much. 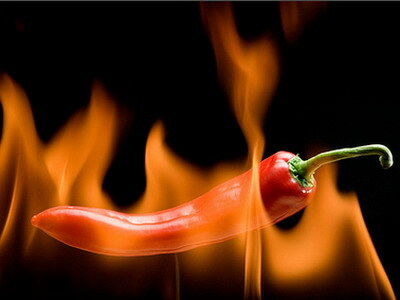 Spicy food is good for you (generally speaking) and can help suppress appetites!